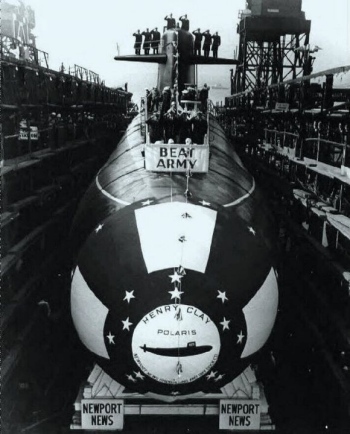 About the picture: The submarine/banner holder in question is the ballistic-missile boat Henry Clay, just before it was launched from Newport News, Va., in November 1962. The sub, named for a three-time presidential candidate whose pre-Civil War government service spanned more than half a century, was commissioned in February 1964 and served for nearly 35 years. About the game: President Kennedy watched the Midshipmen make the sub builders proud, cruising to a 34-14 victory at Philadelphia’s Municipal Stadium on Dec. 1, 1962. Two years later, Navy would fall to Army 11-8 in the same building, rechristened JFK Stadium after the fallen leader.